The IROC Firebird is truly an under-appreciated casting given its real-life racing history. Granted, the International Race Of Champions (IROC) Race had always been run and raced like a professional sports all-star game where the selection of “all-stars” is always a little suspect and the format usually favors one class of all-stars versus another. So while the concept of a racing competition featuring drivers from all backgrounds sounds intriguing (just like an all-star game), the very real problem on finding an equal platform (race) for all to complete is troublesome. 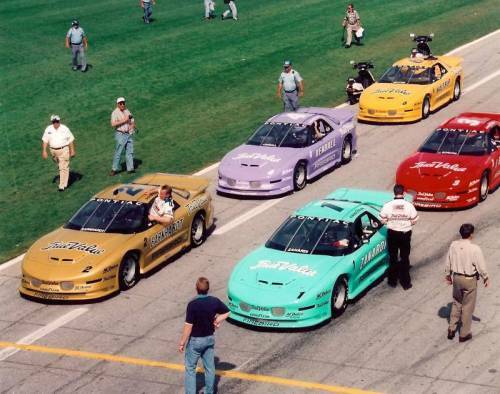 Give the IROC series credit though as they went as far as to create identically-prepared stock cars set up by a single team of mechanics to make the race purely about the driver’s ability to drive. The inaugural race was in 1974 with Marc Donohue being the first driver to take home the championship in a race of Porsche Carrera RSRs. Over the years, the cars/manufacturers changed. Those last 11 years of races featured that very same Firebird Trans Am body style that the Hot Wheels IROC Firebird was based off of. So while the IROC series went under in 2007 (due to lack of a sponsor), the Hot Wheels IROC Firebird has lived on. While the potential is there to have some sort of vintage racing release featuring a historic paint scheme, the likelihood since IROC went under is not likely. Still, image how cool this casting would have looked in 2011’s Hot Wheels Vintage Racing line with metal body & metal base with real riders tires and one of the past winner’s paint schemes. Since no such release was ever made, the best version of this casting would have to be the one featured today, the 1998 First Editions version. Decked out in a metalflake gold paint job featuring an almost authentic racing scheme, this car is about as real as it gets in the Hot Wheels mainline. This car is very close to the ones in this >> PIC << from the ’97 series. Short of the driver’s name and #1 (instead of #2), it looks like the one Dale Earnhardt Sr. drove that year. It even has the True Value sponsorship! The IROC Firebird has received some lackluster graphics over the years creating for many less-than-desirable releases. To make matters wore, in 2011, the HW Main Street release lost the detailed racing interior (roll bars and all) and even made the window netting part of the plastic window piece. This created a weird “glass net” look. So while this under-utilized, under-appreciated casting still limps through various Hot Wheels segments, the potential is there for a really cool piece of racing history from a now defunct racing series. RELEASE DETAILS: Metalflake Gold Body (metal). Tinted Windows. White Interior. Black 5-Spoke Wheels w/ Goodyear Eagle tampos. Gray Base (plastic). Made in China. Toy# 18544. Released in 1998 as #16 of 40 in the 1998 First Editions.